Cost to install copper gutters varies greatly by region (and even by zip code). Get free estimates from gutter contractors in your city. Cost to install copper gutters varies greatly by region (and even by zip code). Get free estimates from gutter contractors in your city. 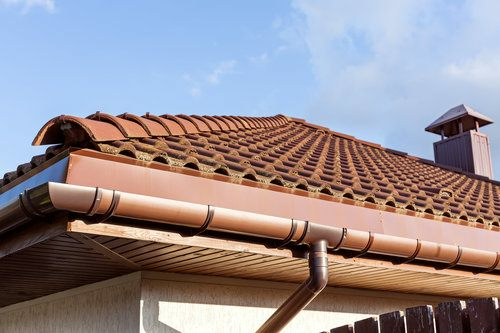 The average cost of installing copper gutters is $3,110. How much does it cost to install copper gutters? Residential gutters are made up of horizontal gutter sections attached at the roof edge, and vertical downspout sections that carry the water to the ground. A typical home will need 125 to 200 feet of gutters with downspouts every 35 feet of gutter. It is further necessary to conduct water away from the foundation at ground level. Innstalled average copper gutter costs will vary with total gutter length, building height, labor rate, and the number of corners, couplers, hangers, and downspouts. A typical residential installation is of 140 feet of copper gutter with four downspouts and four corners. It will typically cost around $22.22 per foot to be professionally supplied and installed. The DIY Material Cost is around $17.17 per foot of gutter. The Total Cost includes 12 man-hours of work by an especially skilled sheet metal worker. The copper metal installation requires special metal and copper working tools and skills. The brave DIY homeowner should count on at least 16 man-hours of work between two persons (an 8 hour day for the crew), and will need to be working safely atop ladders or scaffolding 2. Normal hand tools are also necessary, and a power drill will be useful for drilling and screwing. Gutter Guards - there are dozens of varieties of aluminum material gutter guards, with DIY and professionally installed options among them. The additional material costs for this example project can range from as little as $1.00 per foot for the simplest snap-on filter material to $3.00 per foot for an intermediate diamond stamped material, to $5.50 per foot for the deluxe hinged 3 type protection. Additional labor cost will be minimal during gutter installation, however if it is a separate project the labor cost could rise to $1.50 per foot or a minimum job-cost set by the installer. Downspout Screens - in addition to using gutter guards, a homeowner may want to consider installing downspout screens. 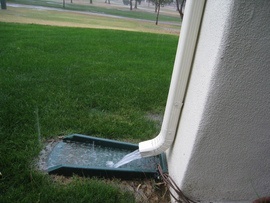 These redirect floating debris away from the downspout opening and allow water to drain away immediately. Heat Tape - there are many heating elements that are impervious to the effects of freezing temperatures, ice, and water and these will help to prevent ice from forming on top of, or inside a gutter. While a homeowner is installing gutters, or having them installed professionally, they may want to consider installing heating elements wherever icing occurs. Copper discolors with age in tones of blue and green, but does not rust. No taxes or permit fees are included. 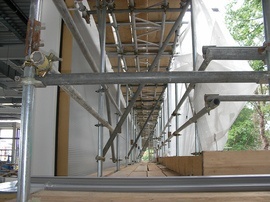 For a two-story home the cost will increase by downspout sections and any increase in installation preparation or equipment such as scaffolding 2 not included here. Removal of old gutters by contractor will cost around $0.61 per foot. Professional gutter cleaning will cost approximately $75 for a single service. In most areas it is necessary to clean gutters at least three times each year. How much does it cost to install copper gutters in my city? Cost to install copper gutters varies greatly by region (and even by zip code). To get free estimates from local contractors, please indicate yours. Cost Considerations: Splash blocks are generally under $10 per piece, although decorative cast aluminum versions can run as high as $70. 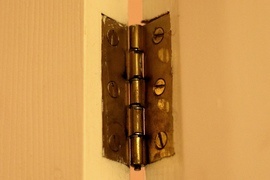 A type of joint that attaches two items together but allows one of them to swing back and forth, such as a door attached to a door frame.